NEC Technologies India Private Limited successfully hosted the NEC Innovative Solutions Fair (NISF) 2018 in Mumbai. Themed “CurioCITY”, the event showcased NEC’s innovative technologies and solutions in the fields of Smart & Safer Cities, Transport & Logistics, Telecom, Retail and BFSI, Hospitality and Governance through first-hand experience modules and solution demonstrations. The event was hosted for the first time ever in India, giving an overview of the NEC portfolio of technologies at one place. The sixth edition of the event saw six display areas divided into thematic zones- Safer Cities, Smart Transportation, Digital Governance, Digital Enterprises, Smart Connectivity and Skill Creation. Highlights of the event included NEC’sworld leading facial recognition solutions and their real-life applications. The NEC Innovative Solution Fair is a flagship event for the company and was organized in India for the first time. This year’s event witnessed participation from over 500 customers, vendors and new prospects. Previously, the NISF has been held in Jakarta, Malaysia, Singapore, and Thailand. Additionally, 4 seminars and panel discussions were organized on mission-critical topics and were moderated by the influential news anchor and tech guru Rajiv Makhni. NEC’s fingerprint, facial and iris recognition solutions are recognized as the world’s fastest and most accurate biometric identification technologies. NEC is leveraging the power of ICT to achieve a more eco-friendly public transportation infrastructure. These modern technologies around fare collection, vehicle operations, driver management, accident prevention, and schedule optimization are contributing to making rides safer and more efficient for both passengers and drivers. Disruptive new generation technologies have dramatically changed the way businesses run. Enterprises are realigning their strategies to retain their market position and gain advantages through cutting-edge technologies. NEC creates vitality for enterprises, industries, cities, and people, and achieves a sustainable society through Digital Transformation (DX). 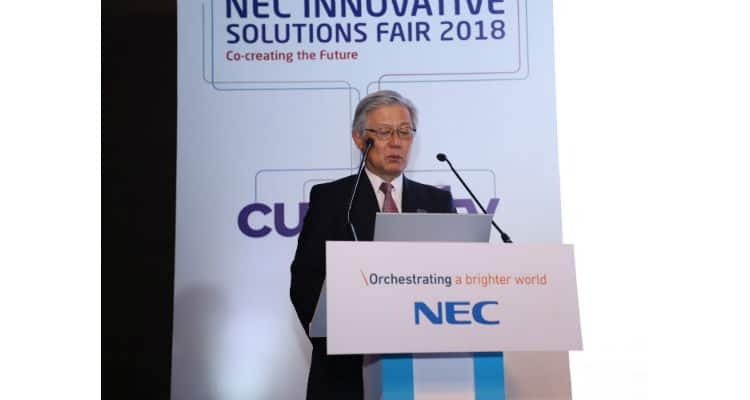 NEC benefits from a track record of proven technologies such as New-age display solutions, Thinking solutions built around AI, Enterprise collaboration solutions, and IoT platforms around manufacturing, logistics and banking. NEC has rich experience and deep knowledge in optimizing networks for both the telecom network and IT fields. Together with Netcracker, NEC has developed a suite of Operation Support System (OSS), Business Support System (BSS), Software Defined Networking (SDN) and Network Functions Virtualization (NFV) solutions to increase the agility of telecom carriers. NEC’s carrier solutions support total telecommunication networks from fixed to mobile, access to the core network, and service application. Looking ahead to 2050, increasing global population and urbanization will require efficient and sustainable social infrastructure. NEC is taking up the challenge of creating advanced Solutions for Society, through the power of Artificial Intelligence (AI) and ICT platforms. Through a strong network of R&D laboratories globally, NEC is committed to developing the “Solutions of the Future” to solve the problems of the next-generation. NEC Laboratories India (NLI) was established in India in 2018 to develop ‘Solutions of the Future’ for India and from India to World.